A new, challenging program of graduate study leading to a Joint Ph.D. in Geophysics has been initiated by the University of California, San Diego, Scripps Institution of Oceanography and San Diego State University. 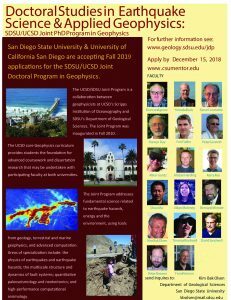 San Diego State University and University of California San Diego are accepting applications for the Joint Doctoral Program in Geophysics. The SDSU/UCSD Joint Program provides full access to the Geophysics curriculum of UCSD’s Scripps Institution of Oceanography, with additional specialized courses and research opportunities offered by SDSU faculty. Assistantships for Fall 2019 are available for research in earthquake physics and strong motion, fault zone structure and dynamics, quantitative paleoseismology, and computational seismology. Successful candidates must meet doctoral admissions requirements of both universities. First, follow the graduate steps to apply. All application materials including departmental requirements must be submitted by the file completion date. Application to partner institution, University of California San Diego, occurs after applicants are recommended for admission by SDSU. For further information, see http://sci.sdsu.edu/geology/jdp/, or send inquiries to Professor Kim Bak Olsen (kbolsen@mail.sdsu.edu).